Honestly, until recently I have not been that great about encouraging my kids to wear sunglasses. Even though I wear them myself consistently when I drive or spend time outside. But after researching toddler and kids sunglasses for this review, I’m a little more determined to make sure my children’s eyes are protected. Why? Because exposure to ultraviolet rays can increase the risk for cataracts and macular degeneration later on in life. But as you would suspect, all sunglasses are not the same. And pictures of super heroes on the frames won’t do anything to keep your kids safe. You need the glasses to block 99 to 100 percent of UVA and UVB rays. Also, if the glasses meet ANSI (American National Standards Institute) requirements or block UV absorption up to 400 nm (nanometers), you’re getting enough protection. The damage from ultraviolet rays builds over time, so the sooner you get your kids in the habit of wearing sunglasses, the better! 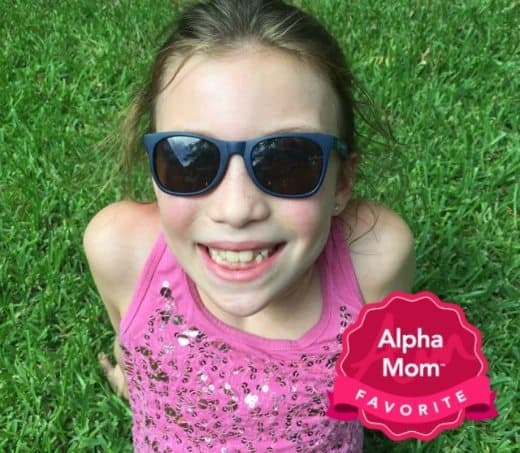 We tried out some top brands of sunglasses (for toddlers to tweens) and give you our review and Alpha Mom favorites. 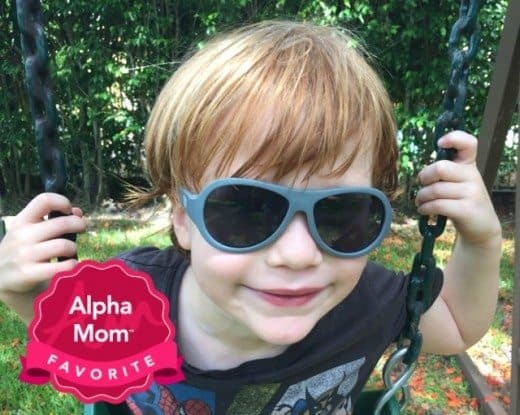 When it comes to toddler sunglasses, these are pretty cool. 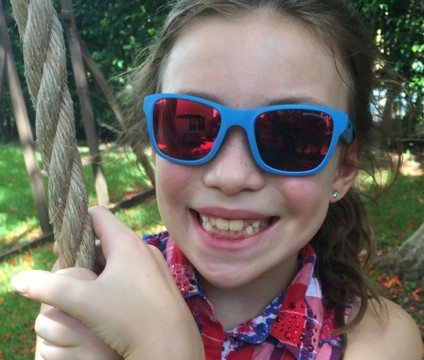 The Real Kids Explorer sunglasses are super flexible and bendy and the company promises you can’t break them. Well, I tried because I like a challenge. And the most I really did was pop out a lens and I was able to put it right back in. The glasses offer 100% UVA/UVB protection (UV 400) and shatterproof lenses. These glasses are non-polarized (but you can get them in polarized lenses for $30 which would mean they virtually eliminate glare. (Tinted sunglasses dampen the glare.) The sunglasses have a wrap around frame and come with an adjustable, removable band to help keep these on your toddler. Here’s the problem – at least for me. My 2 year old had no interest in wearing them and immediately removed them. But maybe your toddler is more chill? Honestly, I could barely take a photo before he was ripping them off. 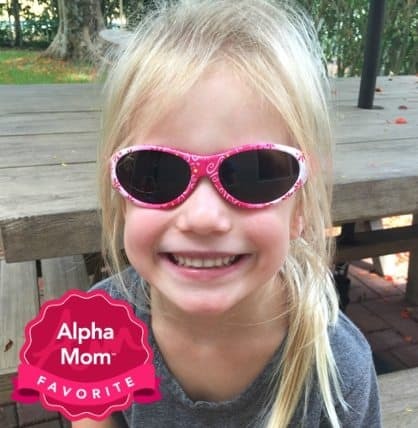 Strengths: 100% UVA/UVB protection (UV 400), polarized, very flexible, durable, shatter-resistant, adjustable band to keep them on toddler’s heads and seem pretty toddler proof (you can get them in polarized lenses). Weaknesses: It can be frustrating to drop any amount of cash on glasses your toddler might not wear. 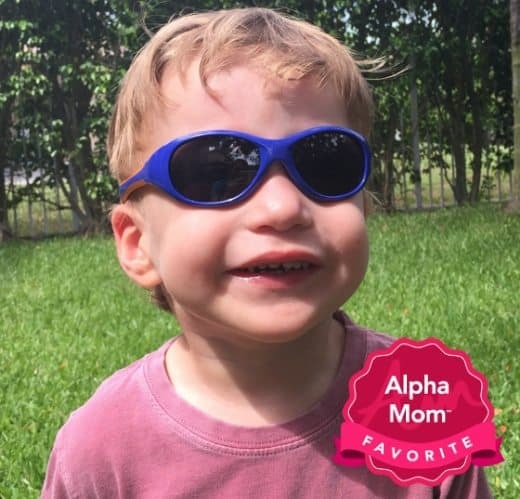 Just like the Babiators goggles we reviewed here on Alpha Mom, these Babiator sunglasses look super cool. The Original Babiators sunglasses are for kids ages 0 to 7 (you pick the size from two sizes when you order; my 5-year old son is wearing the “larger” of the two sizes in this photo). They offer 100% UVA/UVB protection and come in a ton of colors. The best part about these glasses is the guarantee. If a child’s glasses are lost or broken in the first year, Babiators replaces them for free! I mean, seriously? Yes, seriously. But just remember you have to register the sunglasses within one month of purchase. Not bad for 20 bucks right? Strengths: 100% UVA/UVB protection, lightweight, durable, shatter-resistant, amazing guarantee. These Pepper’s Jellie polarized sunglasses reduce 99% of visible glare and offer 100% protection again ultra violet rays. These pink frames come with brown lenses and the blue frames come with smoke gray lenses. These were great for my 5 year old daughter who does have a pretty small face. I tried them on my 5 year old son and he said they fit well too. Strengths: 100% UV protection, polarized and guaranteed (when purchased on the REI website). Weaknesses: I can’t come up with one. 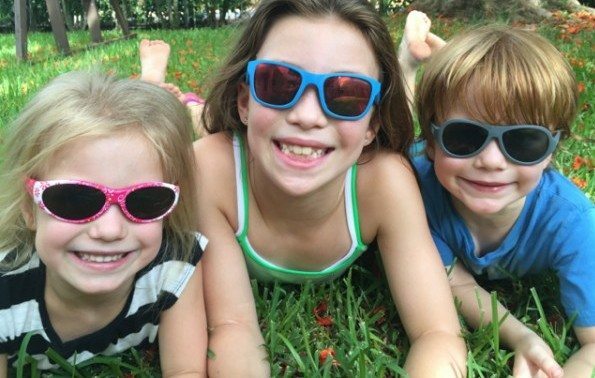 These Julbo Looping 3 are quite similar in many ways to the Real Kids Explorer sunglasses reviewed above. These Julbo Looping 3 glasses offer 100% UVA/UVB protection. They are flexible, durable and wrap around your toddler’s head. They fit my 2 year old son really well. These are non-polarized sunglasses even though they have a mirror lens. What’s cool about the Julbo Looping 3 is there are no hinges and the frames are reversible. This means there is no way for you to put these on your child upside down. Which is great when you’re trying to throw those sunglasses on as quickly as possible! The company promises that these glasses won’t leave the face of even the most active child. They do have an adjustable, removable strap to keep them on. But just like the Real Kids Explorers above, my 2 year old son took them off immediately and just would not keep them on. Big sigh. Strengths: 100% UVA/UVB protection, flexible, no hinges, frames are reversible and adjustable strap. Weaknesses: A lot of cash if your kid won’t wear them and you won’t be able to fold the glasses to make them flatter when you’re storing them. The Julbo Reach sunglasses offer 100% protection against UVA, B and C rays. (UVC rays are blocked by the ozone layer so it’s really UVA and UVB rays that we need to worry about.) These lenses are Spectron 3+ which means they block 88% of visible light. They are lightweight and are described as shock resistant (although it’s not entirely clear to me what that means when referring to sunglasses). My 8 year old and 10 year old daughters love these glasses! They adored the color, the mirrored lenses and thought they were super comfortable. Of course, now they fight over this pair. Strengths: 100% UVA/UVB protection, lightweight, durable and look cool. Weaknesses: The price. 40 bucks for sunglasses? Way too steep for my budget. These Junior Banz sunglasses really come in some awesome camouflage colors (Nordic Camo shown below) and fun designs. These glasses offer 100% UVA/UVB protection (UV 400) and are category 3 polarized lenses. If sunglasses are polarized, it means they can practically eliminate blinding glare. And any sunglasses in category 3 offer a good level of UV protection and a high level of sun glare reduction. The wrap around frames are shatter resistant. These glasses come with a carrying case and a removable neoprene strap. Even though these glasses are supposed to be for the 4 to 10 year old set, they were too big on my 5 year old twins. So I would really buy these for slightly older kids. Strengths: 100% UVA/UVB protection (UV 400), polarized and cool colors and designs. Weaknesses: Too big for younger kids and a bit pricy. 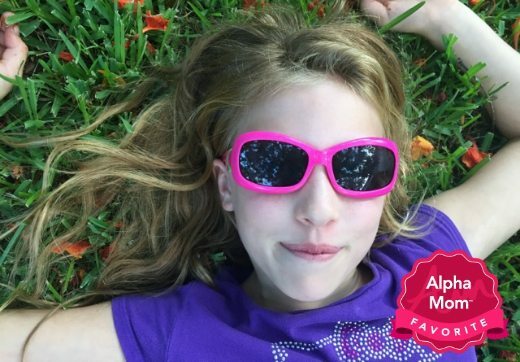 These Real Kids Breeze sunglasses are for age 7 and up and come with 100% UVA/UVB protection (UV 400). They are super flexible and seem quite durable. A wrapped style provides protection from peripheral light. Comes in fun colors. Also available polarized for $30. I love the boxy look of these sunglasses and they fit my 10 year old well. Her only complaint was that the rubbery feel of the glasses tended to pull her hair a bit when she took the sunglasses on or off or put them on top of her head. Strengths: 100% UVA/UVB protection (UV400), very flexible and cool colors. Weaknesses: Because they have a rubbery, flexible feel, they tend to pull hair a bit when taking them on and off. Actress Jessica Alba started The Honest Company because she felt there weren’t enough non-toxic household products available in the marketplace. Her company collaborated with Knockaround (a sunglasses and accessories company) to create these sunglasses. These Honest Company x Knockaround sunglasses are created from a plant-based plastic (53% plant-based). I mean, who knew you could make plastic from plants?! Kind of crazy cool. These glasses offer UV400 protection (which means they give 100% protection from UVA/UVB rays). The lenses are shatterproof. The glasses are very lightweight. When you first hold the glasses in your hands, they almost seem too light and flimsy. I had very low expectations. 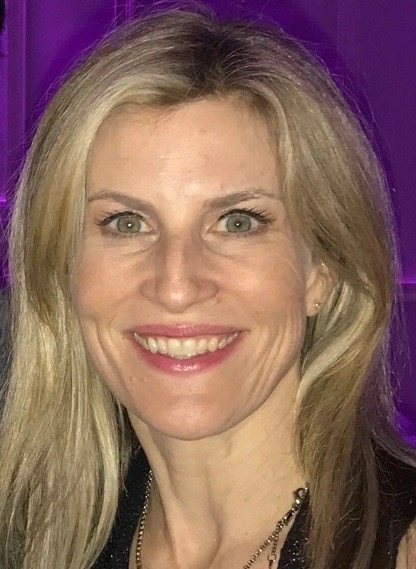 But my kids really liked them – especially my 8 year old daughter! I would have thought they would be too small for her but here she is wearing them and they look great. The glasses come with a cotton canvas carry case. Strengths: 100% UVA/UVB protection, eco friendly, lightweight and affordable. Weaknesses: They almost feel like toy sunglasses because they are so light! My absolute faves were the Original Babiators and Pepper’s Jellie polarized sunglasses because they are both great sunglasses and I love that they both come with a guarantee (the Pepper Jellie one if you buy it on the REI website). I am also a big fan of the Honest Company/ Knockaround sunglasses because they are so affordable and I love that they are eco-friendly too. 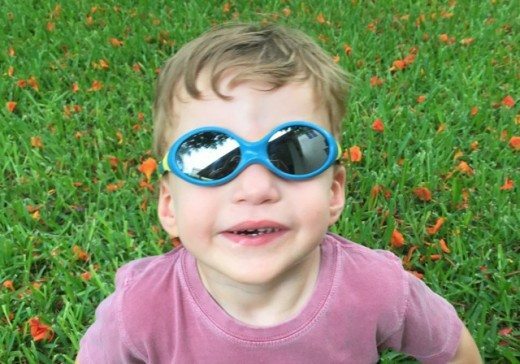 If you are looking for a pair of toddler sunglasses that comes with a wraparound frame and strap, I recommend the Real Kids Explorer sunglasses (a decent price for the non-polarized ones) but don’t blame us if your toddler refuses to wear them. Remember to try out a pair at a store for 15 minutes first to see if your baby/toddler will tolerate wearing sunglasses. Some do and some don’t! 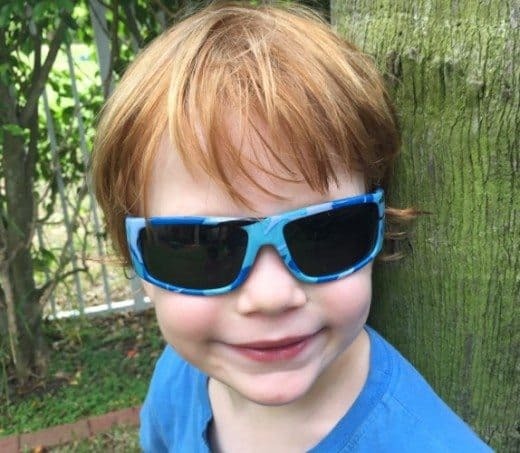 All of these kid and toddler sunglasses reviewed above offer 100% UVA/UVB protection, so you can’t really go wrong. Choose the right ones for your kids and get out there and enjoy the sun safely! 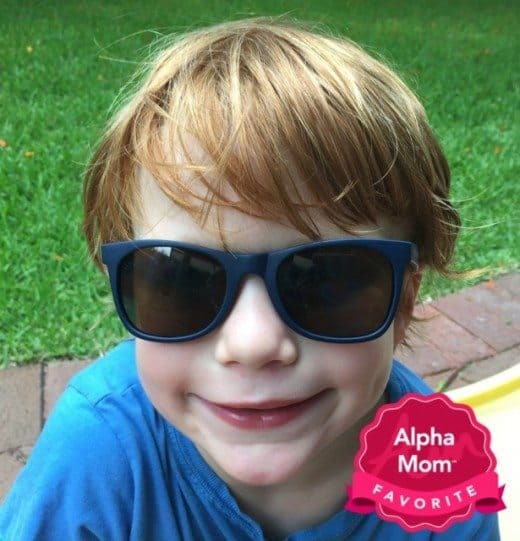 Alpha Mom paid for all the sunglasses in this review.